Get Instant Access and Download SDMP Today! Enjoy A FULLY EXPRESSIVE, CONFIDENT, SUCCESSFUL and FULFILLED Life? By Overcoming Stuttering The Right Way! If you allow 10 minutes of your time to read this and follow what I’ll be sharing with you, not only your speech but also your WHOLE LIFE may change beyond your wildest expectations. If you choose the first case and skip this, then I wish you all the best in the future. Otherwise, LET’S ROLL because I can’t wait to share those high value, life changing material with you! I exactly know all the negative emotions, destructive thoughts and limiting beliefs you are going through. I know a bit too well what it is like to live with a stutter. How? Because we have something in common!.. And I know what it is like to suffer from stuttering when there is a great life out there waiting for you to go enjoy and live it to the fullest! Let’s start with the bad one…You may not like what you’ll be hearing, but unfortunately there is no instant cure for stuttering. Anybody, any program or any organization promises you that you can be cured instantly by using their ‘magic' tool, technique or whatever, are MISLEADING you… in the most innocent terms! Instant permanent fluency is something which has been used AGAINST us, because that is what we want...or what we think we want! There is no instant cure for stuttering…at least not yet…and believe me once there is one, I’ll be the first person letting you know about it immediately! Now let’s come to the good news which will annihilate the bad news… It is DEFINITELY POSSIBLE to overcome stuttering. It doesn’t matter what others say or believe, stuttering CAN BE dissolved. You can overcome it to enjoy a fully expressive, confident and a fulfilled life. With the right tools, strategies and mindset, you can reach a point where stuttering would NO LONGER be an issue in your life. In fact, your speaking skills might turn into your most valuable ASSET. There are hundreds (if not thousands) of living proofs of this. You bring yourself and I’ll bring the right mentality, knowledge, skills, tools, models, support, EVERYTHING and ANYTHING you’ll ever need to the table to make this happen for YOU. You probably want ‘fluency’, but with your assertive involvement I can lead you to get a lot more than that. This may not happen overnight but it WILL HAPPEN a lot sooner than you think! You just need to play along. Would you like to try a so called ‘cure technique’ and find out it doesn’t work for you in the real life situations OR would you rather like to know what exactly you are aiming for and reach there in a smart, effective and permanent way? I had times in my life where I was overwhelmed with all kinds of knowledge, researches, speech therapies and extraordinary promises about stuttering. I just didn’t know where to begin, where to go, who to work with and which pathway to follow. I was as confused as hell! I didn’t even know whether there was a real hope or not. You might be experiencing this at the moment as well… and that is exactly why I strongly suggest you to read on, because I have been there before and I exactly know what you need at this stage. If that is the case and you are overwhelmed with zillions of thoughts, I can assure you that there is no need to be confused on your side. I have gone through those steps and experienced it the hard way FOR YOU! It took me years but it doesn’t have to be the same for you. You have everything, ready and waiting for you…the best, top quality, tested and proven! Internet marketers would say that this is the worst move ever but as a stutterer myself who had been a victim of false promises countless times, I want to make myself clear here before we move on. If you are a person who are looking for a ‘magic pill’ to cure your stuttering overnight then I wish you all the best in life and suggest you not to read on, because “Stuttering Dissolution” is not what you’re looking for and I really don’t want you to end up as an unsatisfied stutterer whose expectations have not been met. I cannot guarantee an overnight cure because there is NO SUCH THING. Period! If You Are A Person Who Are Willing To Understand What The Mysterious Puzzle Of Stuttering Is All About And Follow Proven Strategies In Conjunction With Step-By-Step Effective, Result Oriented Models To Overcome Your Stuttering Challenge In An Effective And Permanent Way In The Shortest Time Possible, Then I Can Assure You That You Are At The Right Place Getting One Step Closer To Make Your Goals And Dreams Happen. 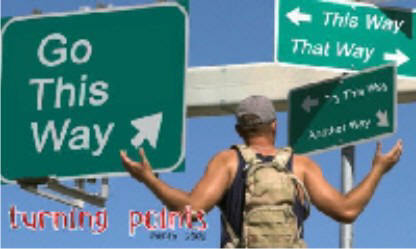 Today Might Be “The Day” For You, The Turning Point. Once you quickly reach that point by following the step-by-step models I’ll be sharing with you, just pure fluency will not satisfy you, you’ll want more than that. You’ll grow as a person, you’ll be a complete person with quality skills, you’ll be an effective communicator with a radical mentality shift and a new life vision. You’ll be unstoppable with the freedom of speech and a brand new you who would serve you to become your best self and live the life you deserve. Do You Experience Some Or All Of The Below? Honestly! You avoid certain words, sounds and situations. You avoid phone and public speaking at all cost. You are self conscious about your speech ALL THE TIME. You want to share your thoughts or tell a story or a joke in a group but you avoid being the center of attention and choose not to speak instead. You want to choose a specific job or career(e.g. 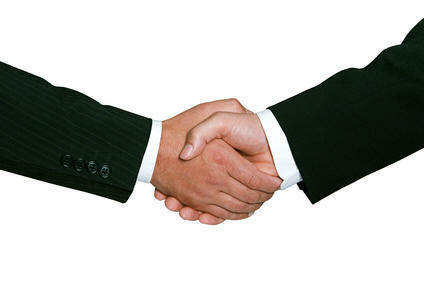 management, public relations or marketing) but instead you pick a career which does not require extensive talking(e.g. engineering). 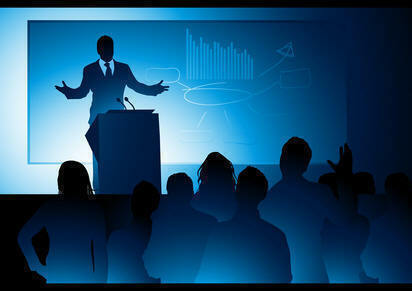 Presentations at work or in school gives you more adrenaline rush than a rollercoaster. You can’t stop thinking about it and how you can manage “not to stutter” during your presentation. That’s all you care; fluency and not to make a fool of yourself in front of others! Having a lot to share, but not being able to EXPRESS YOURSELF exactly the way you want to frustrates the hell out of you… in fact, from time to time you feel like a prisoner who cannot use his/her TRUE POTENTIAL. The emotional pain stuttering causes you is a huge burden on your shoulders… This is not a simple speech disfluency problem for you, it NEGATIVELY affects ALL areas of your LIFE. You believe you cannot live a fulfilled and satisfied life because you feel like stuttering not only BLOCKS your speech but also your potential as a person who wants to SUCCEED in life. You don’t make PHONE CALLS in the presence of others unless you really have to. Speaking, expressing yourself and simple DAILY TASKS have become a huge PAIN for you… and is a massive psychological burden on your shoulders. You want to ask or answer questions in class or in a meeting at work but you choose not to because you think you’ll be JUDGED by your disfluent speech in a negative way. You feel like you are not taken seriously and are seen as “not enough” in environments such as school, work, social gatherings, etc. When you are expected to go through a job interview, you continuously think you would not be able to express yourself the way you want to because of your stutter. So, you lose before you even start...just(!) because of your speech. You want to order a specific food or a drink on the menu but you end up asking for something totally different which you believe you could manage to say easier. You want to make a phone call but instead you choose to send an email or a text message. You want to register for a class you are very much interested in with all your friends, however you end up not registering it because ORAL PARTICIPATION is required for the class in question. You think you aren't enough for your spouse, for your kids and for your family. You don't believe you can provide them the best life they deserve. You want to COMPLAIN about an inferior service(e.g unrecognized credit card transaction) but you avoid to call and choose not to DEFEND your rights...or you give all your information to a loved one to make the call for you. You want to SOCIALIZE or take role in communities but you choose not to just because of the negative emotions you think your speech will create you in such a social environment. Meeting new people is such a stressful experience for you. You let your loved ones to take care of your responsibilities which require talking... and this makes you feel “not enough”. Your SELF-TALK is NEGATIVE most of the time. The need to introduce yourself in class, at a work meeting or social gathering is BAD news for you... you start counting how many people are left before it is your turn. You use ummm, uhhh, welll, I think, like, etc. before a word or a sentence so you can get your breathing going and get the first sound out without blocking. 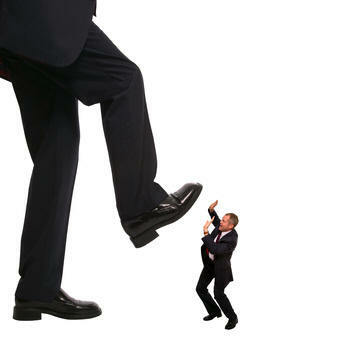 You use synonyms(word substitution) to avoid feared words which you believe is going to cause you trouble. You go through negative emotions, destructive thoughts and you hold limiting beliefs as a result of your stutter. Is your answer “Yes” to some or all of the above points? If so, I can assure you that you are at the RIGHT place. Keep reading and stay with me here because I have a lot of high value, breakthrough material I want to share with you. As I said, this may change not only your SPEECH but also your WHOLE LIFE! Stuttering is the act of holding back. It happens as a result of your divided intentions. One side of you want to speak and express yourself while the other side of you holds back and doesn’t want to speak and be seen as a stutterer… just because you do not want to go through the emotional pain it’ll possibly cause you in case you stutter. Let me tell you this. We cannot solve a problem on the problem level. Therefore, we cannot solve stuttering just by “fixing” it by learning a physical “technique” or a fluency tool or whatever. That is why traditional speech therapy which focuses solely on the physical speech production fails in almost all cases. Just like you probably have… I desperately look for solutions to get rid of those “blocks” which gave me huge emotional pain. I also tried various devices and even medication (what the hell was I thinking!). I searched, studied, learned and tried EVERYTHING I could get my hands on. That is exactly why I am here today writing this letter to you. I am not going to use sales tricks and tell you how this letter will make you fluent instantly! We all have had enough of that, don’t you think so? My journey took me more than 5 YEARS. I had to figure out everything by myself, the HARD WAY. I’ve spent a lot of money, effort, time and energy to take care of the WORST UNHAPPINESS SOURCE of my life; stuttering! I’ve met with some of the most knowledgeable and experienced people in this area, earned their respect and convinced them to share their wisdom with me. ...to be able to give back to the community and help others who goes through the same physical and emotional struggle I had been going through 5 years ago. 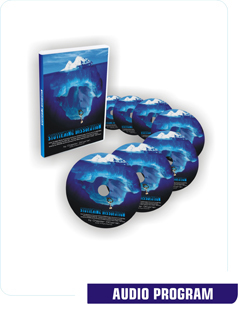 “Stuttering Dissolution” Is The Most Complete And Comprehensive Program Out There Which Will Give You The Step-By-Step Process To Dissolve Your Stuttering In The Shortest Time Possible…Knowingly, Honestly, Confidently, Effectively, Permanently! Stuttering needs to be UNDERSTOOD very well before you aim to dissolve and overcome it. 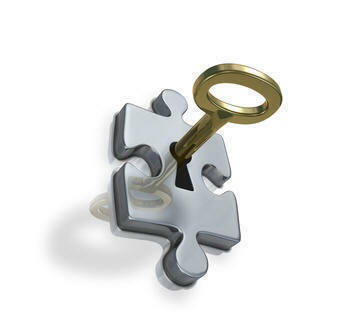 You need to go deep and analyze the core of the problem. Only then you can start getting effective and permanent results. That is one of the reasons why “one fits all” speech therapy approaches have not been able to meet our expectations. No two stutterers are the same, therefore the solution cannot be the same. 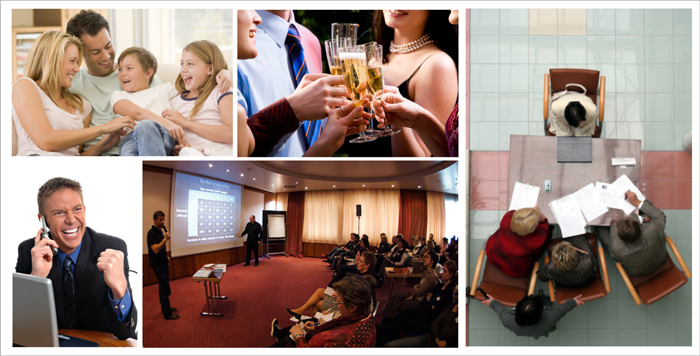 For every single stutterer, a detailed customized approach is mandatory. That is also why even with some effective speech management programs people improve their speech but never seem to get pass a level and reach “the desired outcome”! In "Stuttering Dissolution" I’ll Walk You Through To Come Up With A Customized Model JUST FOR YOU. As I mentioned before, I have already gone through everything and anything possible for the treatment of stuttering. Therefore, you don’t have to go through the same struggles and lose money, time, energy and worst of all HOPE to find out that “it did not work for you”…everything you need is right here, ready to walk you through and lead you to reach your speaking goals beyond your wildest dreams. Stuttering Dissolution is an audio program, or in better terms a multimedia program which I shared all the essentials, tools, techniques, strategies and the mentality you need to break free from stuttering. You’ll have more than 5 hours of audio of me sharing the BEST material with you. 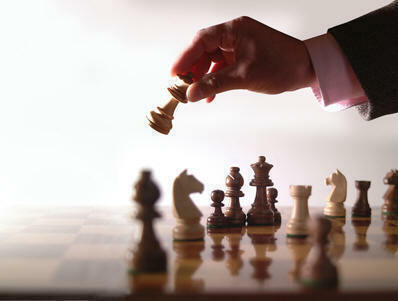 This is the first time I am sharing those fully proven strategies with anyone in such an organized and detailed manner. 5 Hours of audio me discussing how to unlock the hidden mystery of stuttering and step-by-step proven strategies to overcome it. You’ll learn everything from basics to the most advanced stuff in conjunction with related self development subjects on how to succeed in dissolving your stuttering. A 112 page eBook which you can follow with the audio program to be able to see various visuals, graphics and step-by-step models for better understanding. Also, if you are a “reader” type of learner, then you can always choose to read and learn the same material in a more productive and effective way. A Startup Guide video which I’ll explain the content of the program and how you can get the most out of it. I wish I had a package like this when I started my journey. It would have saved me a lot of time, energy and money. But, I had to learn and figure out everything the HARD WAY. I had to go through and find out what works and what doesn’t by myself. I have met thousands of stutterers, I coached hundreds of stutterers. I had the privilege to meet, work and have countless conversations with most of them who were able to make it happen and COMPLETELY OVERCOME stuttering. As a result of everything I went through, observed, experienced, tried, tested and learned in the past 5-6 years, I am in a position now to give you the best material EVER compiled in one package. It doesn’t have to take you years to make this happen. I had to go through it but it doesn’t have to be that PAINFUL for you. That is exactly why I am here today! To make it a lot easier, cheaper, less painful and more effective for you. Everything I’ll share with you is tested and proven by hundreds of stutterers. “Stuttering Dissolution” is a compilation of best and most effective material put together as a result of hundreds of successful recovery journeys. I came up with all those stuff not only as a result of my own journey but also as a result of being a part and observing hundreds of others’ journeys as well. This is the step-by-step guide to speak, communicate and live like the person you have always wanted to be. This is the program which if you follow, will lead you to achieve your speaking and life goals beyond your wildest imagination. I've tried every 'stuttering solution' out there, and I found out something that I didn't expect in a million years. In Chapter 5 I'll explain to you why almost all those 'stuttering solutions' cause you to lose before you begin, and what to do instead to be able to succeed in overcoming stuttering effectively, permanently and in a FUN way! I read all the books, tried fluency techniques, went to various speech therapies, and tried almost everything possible you can think of. It wasn't until I did THIS ONE THING that it all started to happen for me. On pages 33&34 I'll share the single most powerful thing you can do to become successful in dissolving your stuttering. Click Below To Access ALL And A Lot More NOW! Here is why you need to get your hands on “Stuttering Dissolution”. I think we both agree that the emotional pain stuttering causes us is a big burden on our shoulders. It affects all aspects of our life in a painful way. My promise to you is that “Stuttering Dissolution” will add a huge value to you in reaching your speaking goals. “Stuttering Dissolution” is not about trying to be fluent by using a simple lame trick, it is about BECOMING the person who will reach fluency by not setting fluency as the objective but will get it as a consequence, as a by-product! “Stuttering Dissolution” may not make you 100% fluent overnight, however it is a surefire way of reaching all your speaking goals beyond your wildest imagination in the shortest time possible. You’ll feel that you are changing and growing as a person and once you reach fluency as a by-product you’ll realize that fluency is your least feature! You’ll be more than your fluency. “Stuttering Dissolution” will lead you to unlock the hidden mystery of stuttering and discover proven strategies to permanently overcome it. You’ll find answers about why’s, what’s, how’s and what if’s. You’ll get step-by-step models to apply and recover from stuttering once and for all. You’ll learn the most effective exercises about self confidence, setting and achieving goals, exploring who you really are and much much more. If you are looking for a complete change besides your speech then “Stuttering Dissolution” is the answer. 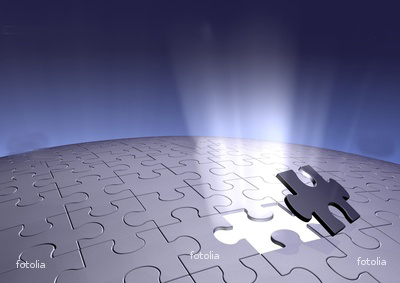 Stuttering is a mysterious puzzle which has not been solved or fully explained yet. SLPs(Speech Language Pathologists) may not like what I am going to say here but I am afraid they are focusing all their effort(with good intentions) on the wrong aspect of the problem. They are working on the problem level but the resource of the problem is hidden below the surface level...and if they keep trying to fix the outcome(physical speech struggle) I am afraid the results they’ll be getting will not be a lot different than the results they have gotten so far. “Stuttering Dissolution” will consider all the studies which have been done on stuttering so far and will give you a roadmap in the light of all those past studies plus the new revolution mental applications on stuttering. Anything and everything you’ll ever need to make it happen for you! In “Stuttering Dissolution” you will get step-by-step processes, cycles, an analytical model which if you put in good use it’ll lead you to dissolve your stuttering. Various number of mental and physical exercises will be all included in “Stuttering Dissolution” as well. Best of all, you don’t need to travel for hours, pay for accommodation, spend time, energy and money to go and learn all this valuable material. I made it downloadable so that you can download and put all those high value material in use instantly just by getting access to it with one simple click! “Stuttering Dissolution” is all about taking action. I’ll show you what to do, when to do and how to do it exactly with step-by-step models so you can make it happen and get concrete positive results in REAL LIFE SITUATIONS... which is what really MATTERS to us! You are tired of all those “learn this magical new technique and you’ll be cured in minutes” false promises. You've paid and went through various expensive speech therapies with temporary or no results. Stuttering is a major unhappiness source in your life and you are ready to put whatever effort is necessary to solve this issue permanently in the shortest time possible. You want to learn the REAL DEAL and don’t want to waste any more money, time and energy on “quick fix rip-offs” or pricey speech therapies which requires you to attend for long periods of time just to learn a physical so called “cure technique”… let aside the emotional burden those treatments will bring to you post therapy. You are a person who has reached an acceptable level in your speech by the help of any type of effective stuttering treatment but it just seems like you are stuck at this level and can’t just pass it to reach your desired outcome, your end goal! You want to discover behind-the-scenes secrets of recovering stutterers who have come a long way in their speech… and eventually reached their desired outcome! You are a person who is helping stutterers. One of its kind and totally different than the rest There is no such program out there like “Stuttering Dissolution”. All we have is very time consuming and pricey speech therapy programs, books, short videos showing us a so called “cure technique” promising instant cure which turns out to another desperation story that makes us feel twice as bad. Stuttering Dissolution is a complete, holistic and outcome oriented multimedia program which will bring you more than fluency!...at the comfort of your own house! You can choose to read or listen besides watching some short but high value videos. No travel needed, no flight tickets or hotel accommodations, no taking off from work or school, no need for a high budget, no hassle, no headache, no worries… simply, nothing to lose…all you need to do is to access it, learn it, put it in use by following everything I’ll be sharing with you there and get concrete real life results…start changing your speech and your life…instantly! Honesty I am not going to show you a trick which will cure your stuttering in 6 minutes 48 seconds. That is a lame promise which as stutterers we all have had more than enough! But, I’ll take you by the hand and show you everything needed including a step-by-step model I came up with to be able to dissolve your stuttering permanently. Recovery is not about what to do, it is about WHO YOU HAVE TO BECOME to succeed and break free from stuttering! By the time you are done with the audios and all the high value material in addition to the audio program, you will have all the strategies, tools and needed mentality to overcome stuttering. We’ll do this in an honest and effective way. This is THE SOLUTION. Stick with it and you’ll reach all your speaking goals beyond your wildest imagination…in a shorter time period than you think! I am here to help I had a time in my life that I needed help to get this part of my life handled. I was fortunate enough to find those people and learn every information/experience I could to be able to make my journey a success story. Today, I am here to give you a hand, walk you through and help you to reach your speaking and life goals beyond your wildest dreams. You’ll learn not only about speech but also about life and lots of self development topics which if you follow and apply will bring you a fulfilled, successful life. I spent thousands of dollars to go through those workshops, seminars, bootcamps and to buy programs, cds, dvds, etc. All for one single reason; to get this part of my life handled… And I am sharing all those best quality, selected material with you in one package, ready to guide you for ONLY a fraction of what I’ve paid for! Through “Stuttering Dissolution”, I’ll help you to get this EXTREMELY important part of your life handled! I am a stutterer myself and I’ve figured it out NOT by reading about it but by LIVING it I am a stutterer too and I know from experience that unfortunately most of the speech therapies out there have no idea what stuttering is all about. This upsets me that even the professionals in this area are trying to solve the problem in the wrong way! You cannot solve a problem on the problem level. All the effort, time, money and energy we put into various therapies and techniques are all turn into useless frustrating tricks by the time we experience the real world. Fluency in the therapy room is not what we seek; we want fluency in the REAL WORLD, in everyday situations. 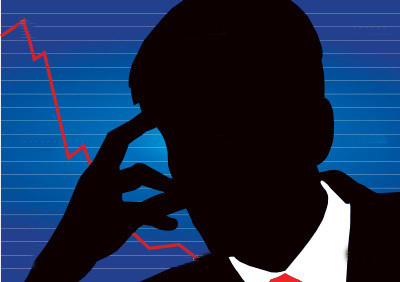 “Stuttering Dissolution” will explain you in detail what stuttering is all about and how to dissolve it with the guidance of proven strategies I’ll be sharing with you. Real life concrete results are what matters at the end of the day! I am aware of every single solution alternative out there There are bunch of programs out there which promises immediate fluency or some sort of control. I can guarantee you that I used and tested almost all of those one way or another in real life situations…not just once, long enough! They don’t lose when it comes to their technique, they actually lose before they even start because of the mentality they have in approaching the core of the problem. 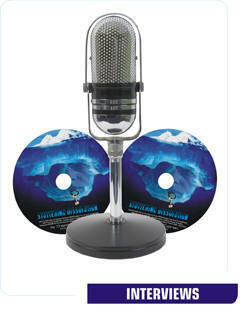 Any high value, quality material from other resources are all included in “Stuttering Dissolution”. “Stuttering Dissolution” is the most complete and holistic program you can ever imagine for a stutterer This program is not just a “learn this magic technique and be totally fluent in minutes” program. 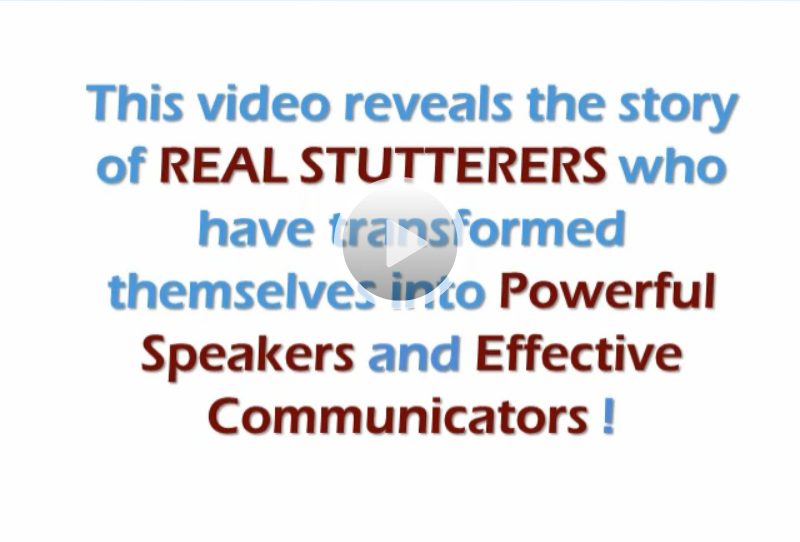 This program is the most complete and holistic program you can ever imagine for a stutterer who wants to do something about his/her stuttering challenge… and overcome it permanently the right way! I designed this program to be the last and the most complete resource you’ll ever need. 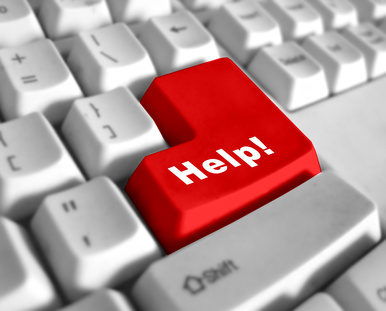 No more surfing the web for answers, no more isolation, no more avoiding, no more living in the shadow of your stuttering, no more negative feelings before or after doing your daily tasks or facing an important situation which requires effective communication and speaking. This is not based on my experiences only, this is about a compilation of hundreds of recovery journeys I think I can consider myself as one of the most experienced stutterers when it comes to trying all the possible ways and techniques out there. Don’t do all the mistakes I have done. Life is too short to learn from your mistakes, learn from mine and from others’ mistakes as well. This will shorten the time you need to permanently overcome stuttering. I care about you Yes I DO. Because I know exactly how it feels to be a stutterer. I know the everyday burden we have to carry on our shoulders because of it. I’ve been mislead and misinformed, may be even lied to at times as well, who knows. They took advantage of my strong emotions about my disfluent speech. They gave me hope till I made the payment. Some might have done it with good intentions but they were unsuccessful bringing me the real life results because they lead me to set wrong expectations. I lost hope several times over and over again and felt like nobody! I don’t want you to go through and feel the same way I did. Most of the stutterers I met through my journey were all nice people inside and they were all willing to help others as much as they could. I know you are no different. Soon you’ll be in my shoes helping other stutterers to turn their speech related goals and dreams into reality. I know that if others can do this so can you! I’d love to help as many stutterers as I can as long as they are ready to help themselves! Studies show that 1% of the world population stutters. Think about that for a minute. That is HUGE. Unfortunately, I can only reach some of them by using the power of internet…and if you are reading this right now you are one of those people. It might be your luck or your desire or your researching skills, or your determination or whatever it is…you get the opportunity! But some others will never get the chance to at least come across and learn about this stuff and totally change their life for better. So, even if you choose not to take this opportunity please forward this to others so they may take advantage of this possible opportunity. My primary goal is to reach and help as many stutterers as I can. I am confident that you will be another success story. I have coached and helped hundreds of others so far. I shared my knowledge and wisdom in every single opportunity. I was always asked to write a book or coach people by following a step-by-step process, by following a fully organized, detailed material. Frankly, I never thought about it before that way. To me I was just helping them. They ask me all types of questions and I’d answer them and tell them what they need to do and set them the right goals. Writing a book seemed like a lot of work to me…and God knows IT WAS. I could talk about stuttering weeks and months non-stop, how could I possibly make it fit in a book? There was no way. But I did it, and even I was amazed how much valuable stuff I was able to fit into this. All the best quality material about overcoming stuttering is there, everything you need. Every single sentence I use in this program is a product of massive real life experiences and learnings. I have done my part, now it is your turn to make this happen and become the next success story. You are only minutes away from the revealing secrets of recovered stutterers I made this entire program downloadable, so you get to access this entire program immediately. No shipping costs, no waiting for mail delivery, no hassle what so ever. I have met with hundreds of recovered stutterers and I know how they did it. After all I was a part of their stuttering dissolution process. Therefore, in “Stuttering Dissolution” you’ll not find what I “think” or what “could” be right, you’ll find all the FACTS, the undisputable truths...And all those are only a click away from you, even if it is 2AM in the morning. It's the full package, everything you’ll need to overcome your stuttering. 5 hours of audio, 2 videos and an eBook... that you can download and listen/watch/read immediately. Literally seconds from now if you decide this is right for you. Yes I want to access this high value multimedia program NOW! So think carefully and make your decision FAST! Life is too short to waste time on overly thinking. What gives us results and desired feelings are not what we think… it is what we DO. You have two choices, you’ll either do it or you won’t. That simple. Do you want to do something about your speech and your life today? It’s your life so it is your call! 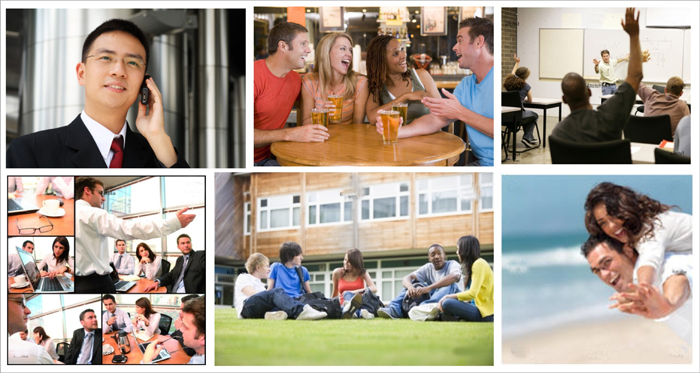 Being able to approach any stranger and speak confidently, effectively, freely. Being able to do everything a so called ‘fluent’ person does, in fact even doing it better than them! A video presentation of me sharing the exact physical technique I’ve used with great success throughout my stuttering dissolution process to break free from stuttering mindset. I’ll explain you the most effective and realistic technique which I chose to use after researching and trying almost anything available on the market. I put together the best, most helpful and effective physical components of speech therapy programs I have learned and tried. This is the exact step-by-step physical speaking technique I customized for myself which gave me the confidence to go out face my fears and challenge my limiting beliefs. Interviews with 2 stutterers who have OVERCOME stuttering and living a quality life with no stuttering issues anymore. These people have not only overcome stuttering but they helped hundreds of other stutterers to dissolve their stuttering. In addition, both of these people are now very eloquent and powerful speakers. We're truly going to get inside their heads, pick their brains, learn how they did it and what would they suggest to people like yourself in overcoming stuttering...see how they approach the subject, what mentality they are in… discover how they get to where they are today. Alan Badmington, has written various articles on the topic of stuttering and also is invited to give speeches all around the world now. On the other hand, John Harrison, is the person who proved me that this can be done and overcoming stuttering is possible. He has a 485 pages e-book about stuttering and public speaking. 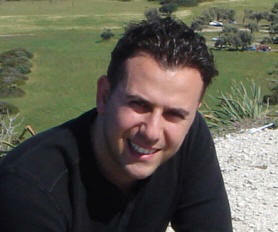 Last but not least, he currently holds public speaking workshops for general public in California. These 2 interviews is about 3 hours long in total. Frankly, these are PRICELESS. I am bringing those people to you with all the right questions you would have asked…just press play and listen those people sharing GOLD material with you, me leading them with the right questions. All you need to do is press play, listen, learn and enyoj it without even leaving your room. 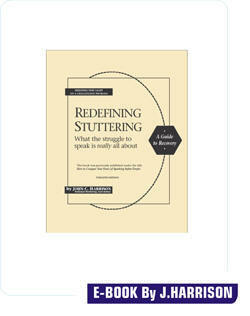 A 485 pages eBook called “Redefining Stuttering: What the struggle about speech is all about” by John Harrison. 5 Hours of audio me discussing how to unlock the hidden mystery of stuttering and step-by-step proven strategies to overcome it. You’ll learn everything from basics to the most advanced stuff in conjunction with related self development subjects on how to succeed in dissolving your stuttering and live a fulfilled life. A 112 page eBook which you can follow with the audio to be able to see various visuals, graphics and step-by-step models for better understanding. Also, if you are a “reader” type of learner then you can always choose to read and learn the same material in a more productive and effective way. A Quick Startup Guide video which I’ll explain the content of the program and how to get the most out of it. A video presentation of me sharing the exact physical technique I’ve used with great success throughout my stuttering dissolution process to break free from stuttering mindset. I’ll explain you the most effective and realistic technique which I chose to use after researching and trying almost anything available on the market. I put together the best, most helpful and effective physical components of speech therapy programs I have learned and tried. This is the exact step-by-step physical speaking technique I customized for myself which gave me the confidence to go out, face my fears and challenge my limiting beliefs. 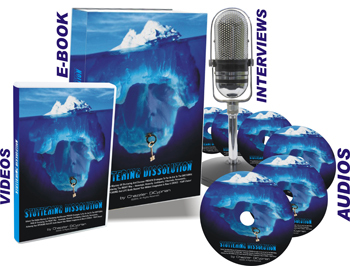 Interviews with 2 recovered stutterers… which we are going to get inside their heads, learn everything about the dissolution process including how they did it and what they would suggest to people like yourself. Redefining Stuttering by John C. Harrison, a 485 pages eBook which will help you in understanding what the struggle of stuttering is all about. You will be able to find the answers of all your why, what, how questions on stuttering. This is a total of easily over $500 worth of value. But you'll get all six when you order right now for only $197. So, I made it ridiculously less than the real worth of the package. For only a limited time, you can get access to all those high value material FOR ONLY $197 $97 $67. 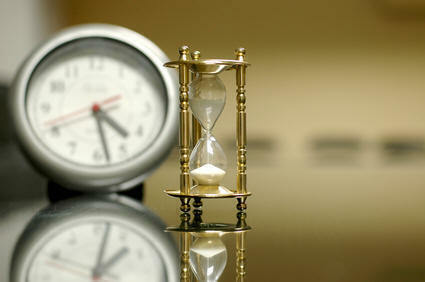 2- I strongly believe the importance of taking immediate action. My life experiences have taught me that taking immediate action is extremely important. It is the difference between success and failure, achieving and wishing. I strongly believe that people who take immediate action should be REWARDED no matter what! Considering that you’ll get ebooks, 7-8 hours of audio and various videos all full of high value material, this may sound like a joke. I am fully aware that this is a ridiculously low price for the package I am offering you here. But as I mentioned above, I am doing this on purpose. I want the people who take immediate action to have something better than the rest who only think(!) about doing something. Some things should differentiate the people who takes responsibility and do something and people who only think about doing something. People have to develop this characteristic, because it makes all the difference in the world when it comes to reaching your goals and living a fulfilled life. That is exactly why I want to reward those people who will not procrastinate, invest in themselves and take immediate action to turn things into “better”… And with all the bonuses and %100 money back guarantee, there is nothing you should think about. YES I want to take action NOW! I wanted to make this an easy call for you. You’ll try this on MY RISK! If you at least try to invest in yourself, what could you lose? NOTHING! But think about what life can bring to you if this package really does WORTH A LOT more than the expected value. This is your call. Because it is your life. But please keep in mind that this extremely low price may not be here the next time you visit. For now it is underpriced for a reason; to reward people who take immediate action and to make it affordable for people who need this material and willing to make a change in their speech and life. Just to give you a hint, the price of this full package will be at least $100 and that is going to take place sometime really soon.. in fact it might be as soon as tomorrow. I cannot guarantee that you’ll find this price the next time you visit this website. You're the only one who can decide whether this program is right for you or not. You know yourself, and you're the only one who knows whether or not you're serious about learning how to put an end to the emotional pain of stuttering and reach your speaking and life goals beyond your wildest imagination. That said, I CAN tell you that this is THE single best, most informative, most powerful multimedia program of its kind on stuttering. I've invested a lot of time and energy creating what I consider to be the ultimate education for learning what stuttering is all about and how to dissolve it effectively and permanently. And if you want to know what the mystery of stuttering is all about and discover proven strategies on how to dissolve it in the shortest time possible... then I can't recommend this program highly enough. This is possibly the most important investment you'll ever make in your speech. I assure you that you'll be able to put together the mysterious puzzle of stuttering and you’ll discover step-by-step proven strategies to put an end to the emotional pain of stuttering the right way! I am confident that “Stuttering Dissolution” will add a huge value to your speech and to your future life. But, I want you to be absolutely sure about it, that's why I am going to offer you a 100% MONEY-BACK GUARANTEE. Listen, watch, read everything in “Stuttering Dissolution” and see for yourself how effective it can be for you. Go through the Stuttering Dissolution program from cover to cover and you'll find strategies you can use RIGHT AWAY to start improving your speech. I promise. Take your time to read, listen and watch the information in “Stuttering Dissolution” and start applying the information you learn. If, after you've done that you decide that it's not for you… or you didn't find any useful information in it for your situation, simply ask for a refund and I will give you a full refund, no questions asked. I truly want to help you with your stuttering challenge. I get emails and phone calls every day from people who are using these materials to DRAMATICALLY increase their speech success in their daily and professional life… and I want to help you too. There is nothing to lose but A LOT TO GAIN. After all, I am offering you to try this out on MY RISK. I’ve shown this program to people who succeeded to reach a level where they are free of stuttering mindset now and asked them to objectively put a value on it. All of them said for a person who goes through the emotional pain of stuttering, the material in “Stuttering Dissolution” would just be priceless. Then when I insist on it some didn’t give up and said still priceless where the not so stubborn ones said it would easily worth $500 to $1,000, especially considering the pricey “cure” programs which makes you feel twice as bad post-therapy. When I think about all the experiences I have gone through and the effort, time and energy I put into this material, I think they are not wrong. But don’t take their or my word for it. You try it and decide yourself. Try it on MY risk. As I mentioned it above, if for any reason you don’t like it, just ask and get a refund, no questions asked. Click below to take an advantage of this opportunity and get the whole package for only $67. 5 Hours of audio me discussing how to unlock the hidden mystery of stuttering and step-by-step proven strategies to overcome it. You’ll learn everything from basics to most advanced stuff in conjunction with related self development subjects on how to succeed in dissolving your stuttering to live a fulfilled life. A video presentation of me sharing the exact physical technique I’ve used with great success throughout my stuttering dissolution process to break free from stuttering mindset. I’ll explain you the most effective and realistic technique which I chose to use after researching and trying almost anything available on the market. I put together the best, most helpful and effective physical components of speech therapy programs I have learned and tried. This is the exact step-by-step physical speaking technique I customized for myself which gave me the confidence to go out face my fears and challenge my limiting beliefs. You’ll get all of the above for ONLY $67. That roughly comes to a dinner of two. Think about this way; take a recovered stutterer out to lunch or dinner to share all his/her experiences with you, it would probably cost you a lot more than the price of the whole package. Just with the interviews, you’ll get almost 3 hours of that. That is crazy! Think about getting access to all the information you can learn in 5 years(let aside all the frustration you’d go through, the effort, time, energy and money you would have to put in it to be able to experience, learn and come up a complete package like this)... 5 full years totally focusing on stuttering 7/24. Doesn’t it worth to at least try those and see what it can do for you, what is possible, for the price of a simple dinner of two? What if there's even a chance that this material can actually teach you what stuttering is all about and how to dissolve it – to live a fulfilled life by reaching your speaking and life goals beyond your wildest imagination? What if you really can learn how to put the mysterious puzzle of stuttering together and get this part of your life handled for good? How much would that be worth to you? A thousand dollars? Ten thousand? More? For most people I know who go through the emotional pain of stuttering, it would be priceless. Just the POSSIBILITY of having this kind of success with your speech be worth the investment. I personally invested over five years and thousands of dollars to learn how to overcome stuttering. I wish that I was able to buy this knowledge, insight and experience for $67 when I decided to do something about my speech and started my stuttering dissolution journey. And I know that you'll be glad you made the investment in yourself once you start listening, reading and watching it. If you don't make the decision to get this part of your life handled right now, there's a very very small chance that you're going to do anything about it in the future. You are only a few short steps away from getting your stuttering challenges handled the right and honest way. I spent 6 MONTHS putting all those material together for you and made sure I included everything I could to help you in your journey and make this happen for you. YES...I am tired of all the bold promises which only makes me feel twice as bad afterwards. I want to honestly and exactly know why’s, when’s, how’s and make this happen for me. If others can do this so can I! YES...I know the offer carries zero risk... And that this crazy low $67 price may not be here tomorrow. YES...I realize this complete package "Stuttering Dissolution" is available for me to download and read/listen/watch instantly! YES...I know that the information I learn here is going to take my speech and myself personally to a completely different level! YES...I am aware that this is possibly the best investment I can make for my speech. I want to make the best investment ever and invest in myself… and in my future NOW! 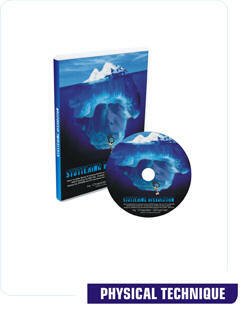 Click Here To Access Your “Stuttering Dissolution Multimedia Program” NOW! I look forward to hearing from you…let me know what you think, let me know what you liked and what could be better…last but not least send me your success stories so I feel good seeing that all my hard work, energy and time have been paid off and I was able to help you to take your speech and life to the next level. real-life situations, and I know that they can work for you, too. happy, you get A FULL REFUND. This is truly a 100% risk- free offer. 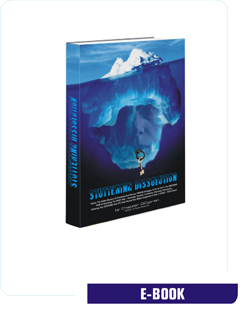 NOTE: Stuttering Dissolution is a downloadable multimedia(ebooks, audios, videos) program. No physical products will be shipped. After you order, you will get INSTANT ACCESS to download Stuttering Dissolution Multimedia Program and all the bonus files onto your computer.